Every night before I go to bed I set my coffee maker on Auto Brew for 6:00 am. I can’t imagine waking up without the sweet smell of fresh beans brewing. I don’t have many vices but my early morning latte is a “must have” to kick start my day. First, I add a tiny bit of raw sugar to a small amount of half & half into my favorite mug. For those of you vegans, almond milk or soy milk is an alternative but I have found it does not froth as well. After 30 seconds in the microwave the creamy mixture is ready for my Aerolatte, the award winning “original steam-free milk frother”. 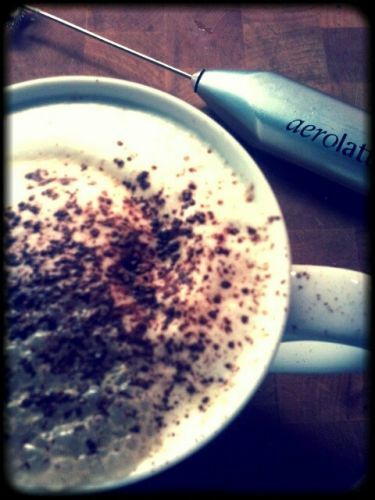 It whisks the hot milk into a perfect froth every-time! I guess it is more of an “au lait” latte because I am using brewed coffee not espresso but it still creates the perfect morning drink. After many visits to Costa Coffee, a UK based coffee house that sprinkles a perfect chocolate heart on every drink, I have made it my tradition. So, I always dust my drink with cocoa powder for a hint of sweetness. Another great choice is to shake some Cinnamon on top, as the health benefits of this spice are bountiful. Sip & enjoy this very “Chique” treat!